Smooth 5.45 treadmill is basically a Smooth 5.25 redesigned and upgraded. Which is a good thing - Smooth 5.25 is among all-time best sellers for Smooth Fitness, a fact that definitely speaks about it's quality and appeal. With 5.45, Smooth kept the price of it's predecessor, while improving the all around quality of the machine and offering better shock absorption and a slightly longer running deck. 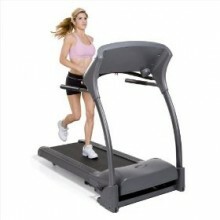 As such, Smooth 5.45 treadmill is a good choice for both walkers and joggers, and an excellent choice for a folding treadmill with a "less than $1000" price tag - if you're looking for a good quality treadmill that is cheap, quiet and endurable, Smooth 5.45 is second to none. Intuitive LCD screen showing speed, time, incline, distance, heart rate and burned calories. Dual-Stage, Soft Drop Folding for easier moving and folding. Patented absorption system offering less impact and smoother cushioning. Automatically adjusts the intensity of your workouts according to your heart rate. Whisper Weave� technology and a quiet 2.5 HP motor ensure quiet operation. Do you have any experiences with Smooth 5.45 or any other treadmill ? Help your fellow exercisers by writing a short review about your machine.